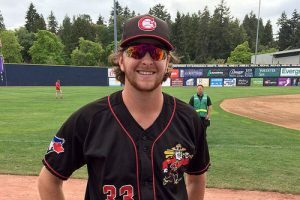 Right-handed pitcher Brayden Bouchey performed well out of the bullpen for the Vancouver Canadians last season. Maintaining an impressive 1.07 WHIP, and holding opposing hitters to just an average of .194 against him in his 30 innings; was a promising sign that Bouchey is ready for a bigger opportunity next season. His success on the mound comes from his ability to keep hitters guessing with his pitch repertoire. Currently using a mix of a fastball, 12-6 curveball, changeup, and slider; Bouchey discusses how he likes to use each pitch every outing. Bouchey uses his unique blend of size and backspin on his fastball to keep hitters off-balance. Describing how the backspin is similar to that of his curveball, the righty is able to work off either pitch in game situations. With this ability, there’s little question why Bouchey had a memorable season pitching for his hometown club. Describing that experience in detail, Bouchey talks about pitching at Nat Bailey Stadium. While his time in Vancouver may have ended, Brayden Bouchey still has a lot to look forward to in 2018.